In my family, sleep away camp was a pretty big deal. I went to camp for 10 years. I started as a camper and I ended as a staff member. It was the most incredible experience of my life. I knew that when I had children I would send them there as I would never deny them the experience of such a magical place. A. I asked you guys for theme suggestions on my Instagram story and Camp was a big one. B. My older son is at sleep away camp now (the one I went to!) and Luke will be testing it out later this summer. So it seemed like a perfectly fitting theme. So here you have Camp Luke for Luke's 6th birthday. We had a lot of fun brainstorming all the ideas for this one in the office. Maggie designed up the most perfect logo and Natalie threw it onto everything...customized camping mugs for favors, custom signage and water bottles. Crafty Maggie made a Camp Luke sign on a canvas piece of fabric and then attached it to a couple of wood poles. We found red lanterns to line the table with and we ordered a few teepees to set out on the grass which turned out to be a huge hit amongst the kids because it was so hot outside so they used them as an escape for shade. I throw this party every year as a combo for Luke's birthday and to gather our friends and family for the 4th of July, to kick off the summer. Every year I work with Seasons of Southampton to serve a fantastic spread of lobster, bbq chicken, corn, potatoes and coleslaw. We also swim, set up a huge water slide and pump out fun tunes. Over on the bar, we served a cooler of wine for the big kids, sodas, lemonade and tons of water to stay hydrated because man it was HOT! My husband absolutely LOVES Narragansett's Shandy Beer so our friends over there sent us a case to enjoy for Luke's party. Thank you guys! We went through it ALL! To close out Luke's birthday we served the most incredible cake you'll ever lay your eyes on...Luke's Log by Angela of Making that Cake. When we cut inside...it was buffalo plaid! AH! 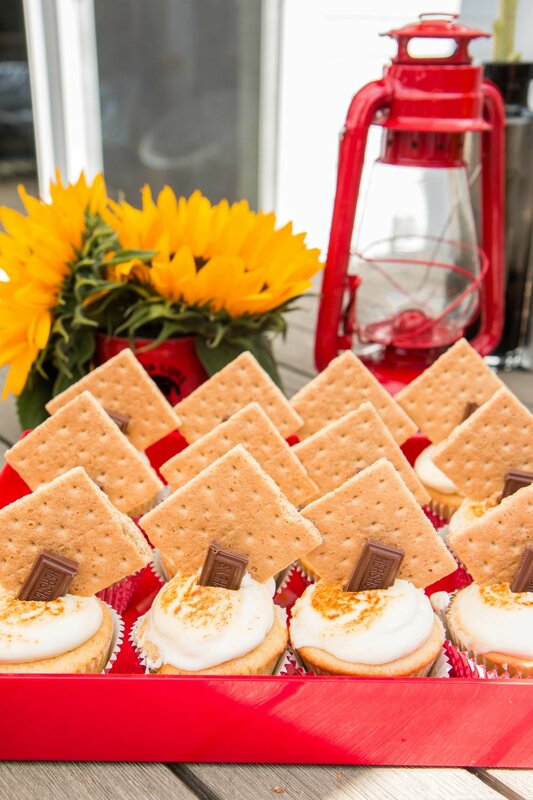 Angela also made us s'mores cupcakes that were so delish and perfectly fitting to the theme. Luke's birthday party also happened to fall on my father in law, Stu's actual Birthday! So we had Angela whip up a golf ball themed cake since he LOVES to golf! Luke & Stu blew out their candles together and then my sister in law gave Luke a toy saw to cut his cake with...which was genius. The years are flying by and now that Luke is 6, he may be off to overnight camp soon. Personally I think he's too young to go next year as he'll only be turning 7. I'm hoping I get one more year with him at home alone while Gavin is away. Once they are both gone, don't think this party comes to not...I will still have it as I will forever celebrate the birth of my son whether he's in town or not. Read the story of Luke's birth and you'll understand why this celebration will never end. Happy Birthday to my baby boy. I am so proud of the young man you are becoming. You are so smart, happy, loving and I could not be luckier to be your mother. I love you, Luke.